Well, as most of you know, Shannon was admitted to St Joes and stayed 18 days. Less than a week later, she was back in the hospital, this time at Chandler Regional. She was having random contractions, some worse than others. Because the babies were preterm, they were trying to hold off on delivery as long as possible. Finally, for many reasons, the doctors decided to stop all the medications to stop labor and see how she does. Wednesday night, Shannon wasn't feeling the greatest, and she had swelled up like a balloon all over her body.Then, almost all the sudden, she was having a very difficult time breathing The doctors did a few tests to see what was exactly was happening to Shannon. They looked for blood clots, pneumonia, and heart problems. All the tests were pretty inconclusive as to what was happening. The doctors got together to decide the best course of action. 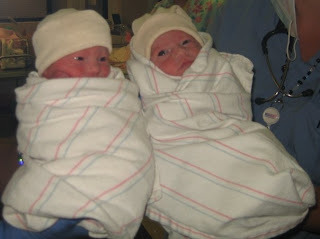 After talking with Shannon and I, it was decided that it was time to deliver the babies, and then fix Shannon. Our doctor decided because they weren't sure what exactly was happening, they chose to admit her into the ICU right after delivery. This was strictly a precautionary move to make sure nothing serious happened. After another round of tests, it was decided that her breathing problem was only fluid build up in her lungs. Shes currently is still in the ICU, but VERY stable. We expect to be moved downstairs to the labor and deliver rooms sometime early this afternoon.